Beta release of my latest map. Still beta, i have bases and such. I am also working on a map that i call "The hive", its geometry is based on hexagons and it even gets me lost once in a while, but i don't i will able to finish that in time for the summer release. 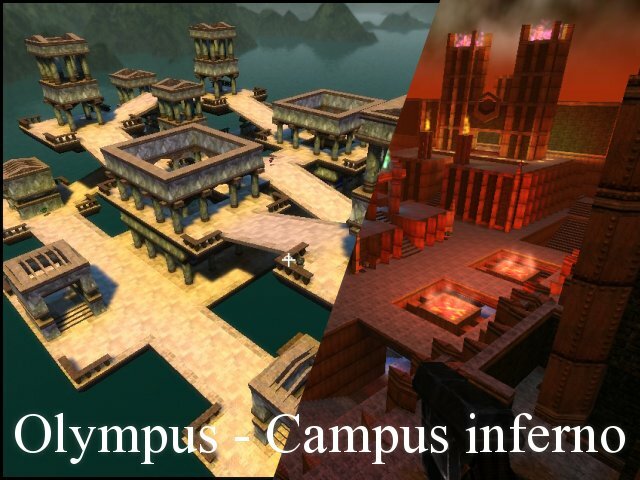 Haven't done much about Olympus, but i made a mappack that includes the Devils playground, Campus Inferno. Have a go at it. I'm quite impressed by the mathematical precision of your design, and the purity of it's texturing. The geometry and texturing definitely fit the cube mentality. I only noticed a couple of obvious bugs. The very bottom of the map has a few errors, where the geometry doesn't quite come together, or a skybox texture is used. Nothing major, very minor in fact, not affecting gameplay at all. However, the other bug I came across does affect play. If you run across one of the highest bridges, and try to jump onto the geometry to the sides, you'll probably get stuck between the platform and the pillars. You should probably just do some low-key clipping to keep people from slipping in there in the first place. The third thing is so much a bug, just a shortage- if possible, would you consider going around the map and adding AIclip so that monsters will not jump off the edges? It'd really help the singleplayer value. Finally (and this is just an artistic opinion, but I'll go ahead and voice it) I feel like the sunlight is too strong. I'd damp it down just a bit, so the textures don't get washed out and the lighting fits the skybox better. Looks great, hope to see this in the release! If the maps look messed up in newer Sauerbraten releases you can fix this with /remip. I'm having trouble too. The map's basically invisible but I managed to fix this by deleting a block.. Of course this ruined the lighting. Olympus has a cool design, decent flow. I'd like to play that. Campus Inferno is kinda annoying. It has ALOT of stairs so the gameplay is largely monotonous. How you know it will be "summer release" ;D.
i already seen those map on ctf already, and they always just give bugs, i really dont know why :s.
If u dont look at those bugs, the maps looks very nice :D.
3/5 cause of those bugs D:, plz fix them then u really will get close to 5/5 :D.